Be comfy, be practical, and be professional thanks to 511 Tactical. The Women's Taclite Pro Short (63071) is crafted using a 6.14 ounce blend of polyester and cotton ripstop for a lightweight fabric that moves with you, and the gusseted crotch and action waist only add to the flexibility of that range of motion. 511 Tactical's shorts resist fading and wrinkles, and the Teflon finish avoids stains. The Taclite Pro features pockets for knives, mags, signature slash and rear strap pockets, cargo pockets, along with a multiaccess pocket for quick and easy convenience. 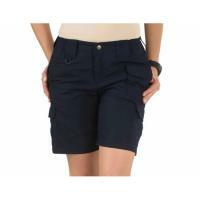 Model 63071 includes a double reinforced seat, as well as double and triple stitching at the seams, and pockets reinforced with Cordura nylon, to make sure these shorts for women hold up under pressure. 511 uses the sturdy and trustworthy hardware of Prym® snaps and YKK® zippers.